John Kaminski (the first licensed pilot in Wisconsin, third from the right in checkered cap) with his new Curtiss pusher, the "Sweetheart." 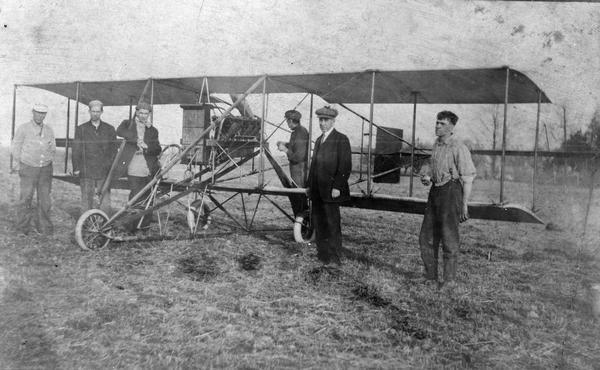 John Kaminski met fellow pilot Jack Knight at the Milwaukee School and College of Aviation in 1912, and he decided to keep his plane at the Knight farm. Because a pusher could not fly even the short distance from Milwaukee, it had to be disassembled, shipped by rail, and then reassembled at its destination. This procedure was necessary for all pilots who traveled on the exhibition circuit. When Kaminski began his exhibition career later in 1912, Jack Knight, who is looking at the engine in this snapshot, went with him as mechanic. The view was taken in Stone Bank, in the Town of Merton, and is an unincorporated Waukesha County community.